As a design professional and avid cyclist, I often find myself analyzing and assessing the level of risk I have while on my bike. For example, I am a fairly confident cyclist comfortable merging with traffic and navigating busy intersections when I am alone. However, when riding with less confident riders such as my children, I look for safer routes that often even include riding on sidewalks and crossing at crosswalks. With the recent increase in the use of vehicular single lane roundabouts within my community, I have been able to experience firsthand what I believe to be some advantages roundabouts offer over conventional intersection designs with regard to safety for cyclists. By the nature of their physical design, motorists approaching and entering roundabouts are forced to reduce their speed. Typical speeds negotiating a single lane roundabout are between 15 – 20 mph. In contrast, conventional intersections rely on the motorist to observe signage and signals. How often have you seen a car speed up to beat a light or inadvertently blow through a stop sign? One of the best attributes of roundabouts is that it removes the uncertainty of where motorists are coming from and which direction they are headed. Especially in single lane roundabouts. Conventional intersections present multiple turning movements and more opportunities for motorist/cyclist conflicts. Single lane roundabouts force bikes and cars to travel the same lane in single file and if designed properly are not conducive to passing one another while in the roundabout. This coupled with the slower speeds allow the cyclists to smoothly integrate into the flow of traffic. 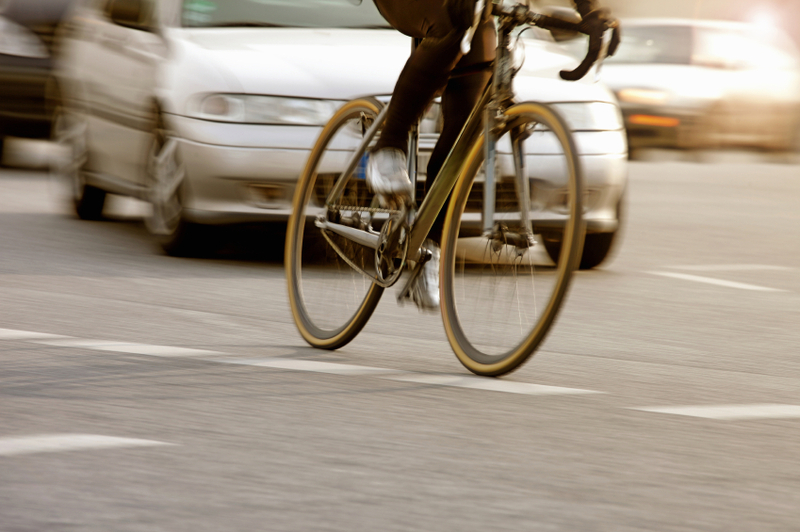 Whether there are designated bike lanes or not, motorists have a tendency to travel alongside and/or pass cyclists on straightaways. This can be particularly dangerous as you approach intersections where the car is making a right-hand turn and the bike intends to continue straight. Expanding on the point above, by integrating the cyclists into the traffic flow rather than separating them, you position them directly in front of or behind motorists allowing both cyclist and motorist a heightened awareness of one another. Navigating conventional intersections, cyclist are often side by side cars, either hidden from view or less visible to other motorists at the intersection. For those less confident cyclists, roundabouts still offer the same safe alternatives to conventional intersections. Proper design can provide shared use pathways leading to safe crossing points at each street leading into the roundabout for both pedestrians and cyclists. In addition, the splitter islands that are used to funnel traffic into and out of roundabouts also allow the pedestrians/cyclists to cross one direction of traffic at a time with a refuge island in between. So as my family and I continue to cycle through our community, roundabouts offer us a safe and predictable way to negotiate otherwise busy intersections along the way. Hopefully these observations are helpful in your decision making process as to whether or not a roundabout is an appropriate design choice for your community. To read more of about our expertise in providing practical design solutions, click on the links below! What Can You do With Roundabout Real Estate?